I don’t know about you, but I have never felt any love for dark elves in any setting I ever played a game in. The same applies to the WHFB figures for dark elves, I’ve never seen anything I really like. They always felt a bit daft and contrived. 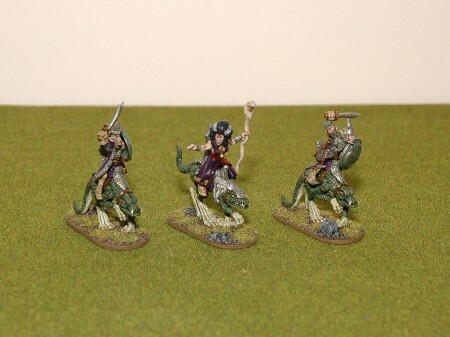 So – what to do with the handful of dark elves I’ve happened to collect over the last few years? 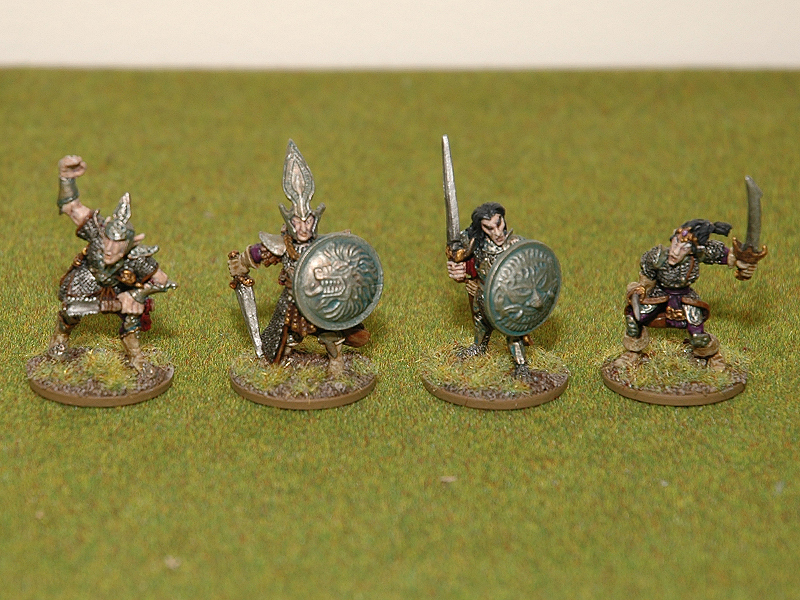 Well, I had Mengil Manhide’s regiment of renown painted up for me by Pil. While enough to run a warband in SOBH, they’re a rather homogenous lot. I figured they could use some bolstering by another batch. 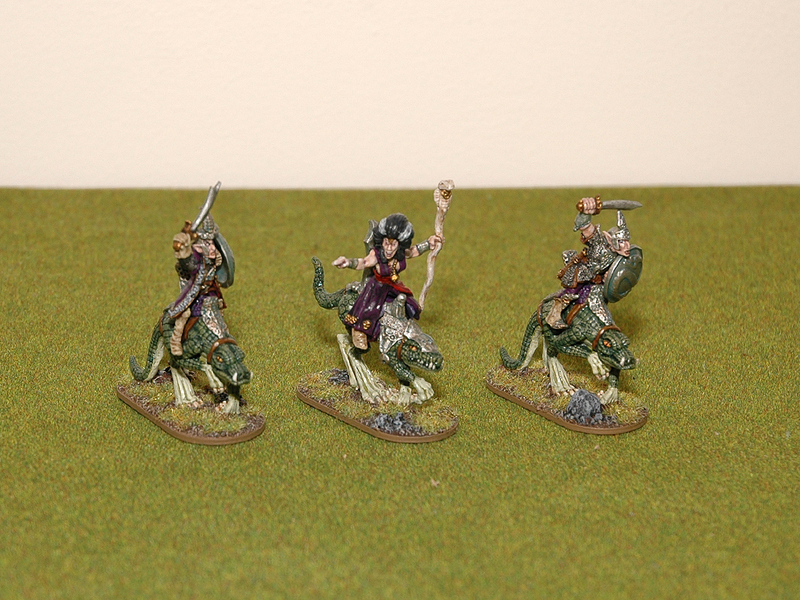 So I scooped up all my remaining dark elves and shipped them off to JollyBob (from LAF/Frothers/etc) for painting. The orcs soon realized they were biting off more than they could chew. He did a great job, but I’m not sure they’ll see much table time. This post have been prepared for almost a year but I haven’t been able to post it as I could not, for the life of me, come up with any fluff and background. Especially the names caused me problems. I think it all boils down to how humourless and bleak the Warhammer fluff for dark elves is. They’re like the dark, brooding and pretentious teenagers of the Old World. In large, these are the remnants of a raiding party that set out from Naggaroth, consisting of two ships. After looting and pillaging successfully eastward through the northern parts of the Empire, they ran into stiff competition near the Northern Wastes and the coven was decimated by a much larger chaos regiment. The matriarch of the coven, Lidygia, flanked by her body guard. The two body guards are C21 Cold One Riders, by Naismith. Ligydia is a more modern (and not very likeable) Marauder MM74 Dark Elf Sorceress. Probably sculpted by Aly Morrison. The cold ones follow the same pattern, left and right are C21 Snarlers while the centre one is an MM74 cold one. The three scouts, with captain Hoex in the middle. 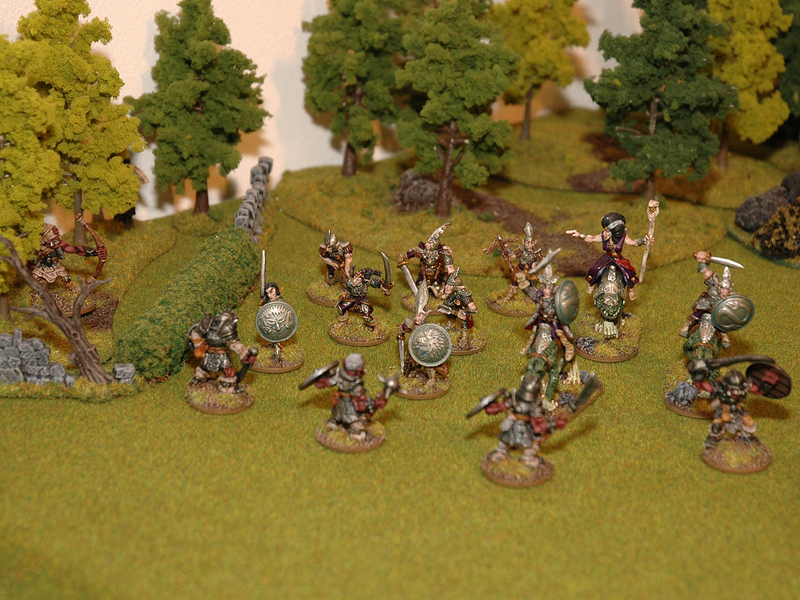 The two scouts are C09 Dark Elves by Bob Naismith, 1985 or 1986 releases. Captain Hoex is the (evil) dark elf captain from the BC2 Monster Starter Set. Captain Neviro second from the left, with his aide to the left and to the right his son Malus and daughter Debelia. 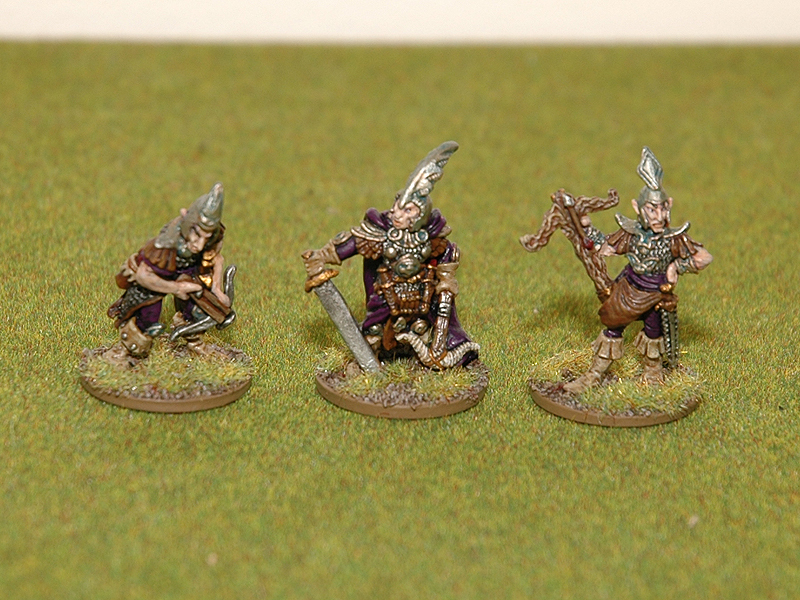 All of them C09 Dark Elves by Bob Naismith, anno 1986 (except for the captain who is an earlier release, from 1985). The two ship’s captains blame each other for the fatal defeat, while Lidygia takes perverse pleasure in playing the two against each other skillfully manipulating their passion for her and their rivalry. They realize they need to stay together to reach the shores where their ships lie berthed, thus they reluctantly cooperate. Before they reach their ships, blood will certainly be spilled. A lot of those models are quite familiar to me actually, as Dark Elves were the one WHFB army that I did try to get painted back in ’94. I bought and painted copies of a number of the models shown before selling them on for money to go clubbing one time :D I converted one into a Dark Eldar Archon that was stolen at a tournament in 1999. I dont regard myself as particularly “goth” or “emo” or “needy” or whatever, but Dark Elves do appeal to me for some reason: it may be to do with Michael Moorcocks Elric books. Whingy, moping vampires drive me crazy though – hate those guys. The miniatures look nice, a classic dark elf scheme. The miniatures are quite retro looking. Fully agree on vampires. Ferocious beasts, almost like a different species, á la 30 Days Of Night does the trick for me. The victorian poseur leading a solitary life in a Carpathian castle is not my cup of tea. Did enjoy Tim Burton’s “Dark Shadows” last night though. Naismith had a pretty stiff sculpting style, but I do like the look of them too. Never read Moorcock, which is probably something I ought to remedy now after having read quite a bit of Conan. Especially considering the influence on GW’s fantasy fluff. I have six R.A Salvatore books on Drizzt Doohickey of D&D fame that I got for a song at a sale. I bought two sets and sold one at a profit, so I got my set for free. Still haven’t felt the urge to read them. Im off to pout and write bleak poetry in the attic after that outrageous slur. I may also drink wine and caress cats. It doesnt get much more Halloween than that. The first Elric book is a quick read and the most memorable one (to me twenty years later at least). If you enjoy that then you can decide if the rest are worth a look.